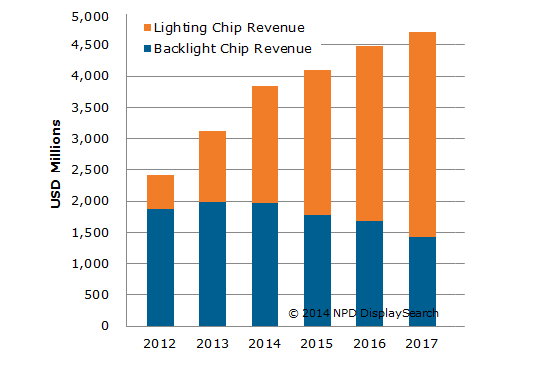 Overall demand for LED chip or also called semiconductor chip is expected to grow from 17 billion in 2012 to 61 billion in 2014, according to NPD Display Search. 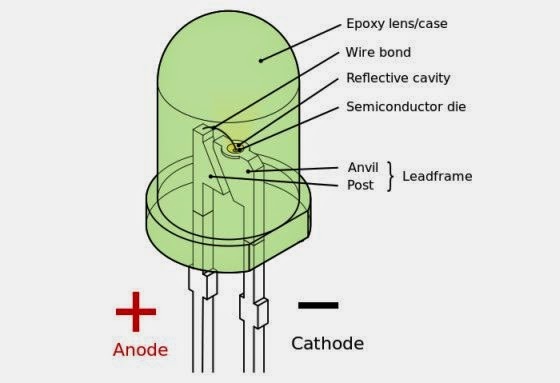 LED chip is the integral part of the fabrication of LED bulbs. Although demand for LED chips for backlight applications in display screens is expected to decline, LED lighting sales are growing, and total shipments of LED chips are on the rise. According to the latest NPD DisplaySearch, worldwide LED lighting chip sales reached $1.1 billion in 2013 and are predicted to reach $3.4 billion in 2017. While consumer demand for LED lighting will continue to increase in the coming years, the demand for LED backlight chips for TVs and other display applications will start to decline after 2014. Demand from backlights is falling due to a combination of slower growth in LED-backlit LCD TV sales and efficiency increases that have resulted in a reduction in chips used per backlight. LED backlight chip sales reached $2.0 billion in 2013, but are forecast to decrease to $1.4 billion in 2017. By comparison, consumer demand for LED lighting has increased since 2012 and is expected to keep growing through 2017. Significant growth in consumer lighting is helping to keep the LED market on an upward trajectory, even with ongoing declines in backlight demand. As costs fall for LED fluorescent tubes, they continue to replace traditional fluorescent lighting, especially in certain offices and garages, where lighting is required on a 24-hour basis. DisplaySearch noted that, the LED tube is currently the most popular LED lighting product because, unlike traditional fluorescent lighting, LED tubes do not contain mercury, are 50 percent more energy efficient, and boast a longer lifespan. TheGreenMechanics: Very well. The Mayoy's pledge to install more LED lamps in and around Kota Kinabalu city is indeed timely. The lower power tariff for public lighting should also incentivise more lamps at strategic places. Important thing is that government is able to use quality LED products. It can be seen that a lot of the LEDs used around KK actually can't make thru 2 to 3 years, when LEDs are supposed to last 50,000 hours or 11 years if use 12 hours a day. Just look at the recent implemented solar powered LEDs on bus stop, in less than 6 months a lot of the bus stops at least have 1 lED bulb burnt. In the end we taxpayers are actually paying more. Talking about the LED lighting on bus stops around KK city, there was this solar panel installed on top the bus stop roof near Secretariat building (State mosque) but the structure is completely under the shade of a huge rainforest tree and there is no point putting up solar panel there. Not sure if it was a deliberate act of ignorance or the installer know little about solar power. That is Why I had Already Purchase Eco-Friendly led spot lights from Autopal.